Cutting to the chase: What exactly is Trump demanding? As the Senate-Congressional conferees kick-off their negotiations, the MSM is still harping on the political-emotional hysteria and continuing to insinuate that Trump wants a Chinese-like concrete wall that runs the entire expanse of the U.S.-Mexico border. 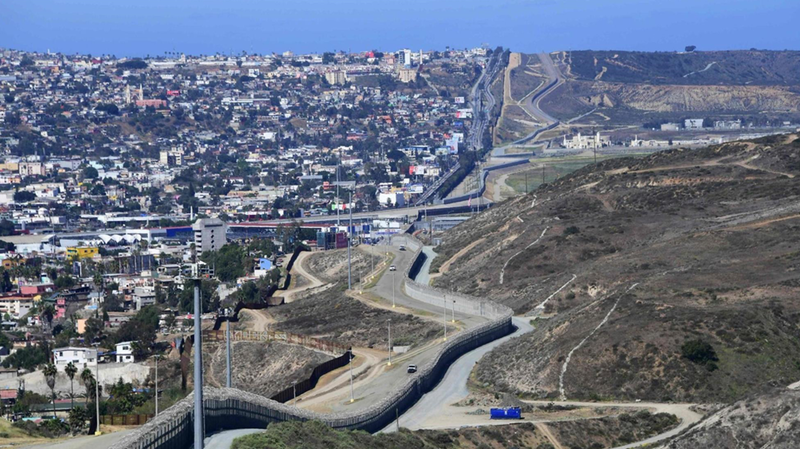 The U.S.-Mexican border is about 2,000 miles long … 1,954 to be precise. About 300 miles is “vehicle fencing” which blocks vehicles but allows people on foot to cross easily. So, what exactly is Trump demanding? Stop right there, professor … proof of citizenship, please ! Unfortunately, this has become an annual event. A summer initiation of sorts. Once again, I was detained for questioning by government officials. No, it wasn’t by rogue TSA agents targeting an alleged conservative blogger. Once again. 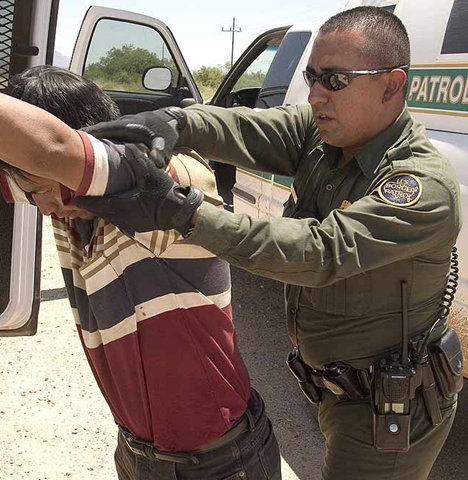 I was suspected of crossing the border to illegally access government-provided services. This year was unusually unnerving. Once again. I was suspected of crossing a border to illegally access government-provided services. Yes, your (usually) mild-mannered man of the classroom … stood up on suspicion of unlawful conduct. An intimidating officer of the state demanded to see a photo ID — proof of citizenship – and my car’s registration. OK, it wasn’t the U.S.- Mexico border … it was the Maryland-Virginia border. The services that I was allegedly attempting to use illegally: use of the “Anne Arundel County landfill and recycling center” (a.k.a. the local dump). That’s right. In order to throw an old desk chair into the landfill dumpster, I had to show my driver’s license and to produce proof of Anne Arundel County, Maryland residency. Fortunately, I may be the only person in Maryland driving around with paid real estate tax bills in my glove compartment. Maryland is a state that – for example – reportedly looks the other way when it comes to admitting illegal immigrants into public schools and allows them to pay in-state tuitions at colleges. No harm, no foul. Photo ID to vote in Maryland? But, the line gets drawn in the sand at the local dump. There has been an epidemic of burglaries in DC. “We used to say that violence was neighborhood-based … now criminal street gangs are organized around armed robberies. In MBA-speak, they used to be organized geographically … now they’re organizing functionally. 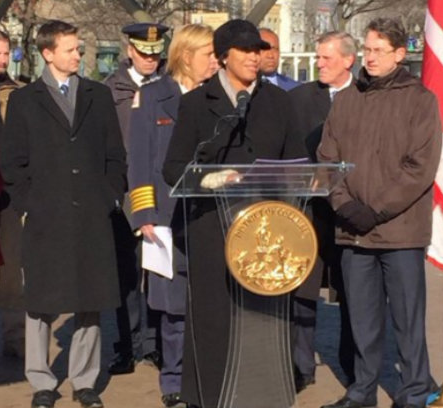 Recognizing the problem, Mayor Muriel Bowser did the what mayors do …. No, it wasn’t by rogue IRS agents in Cincinnati targeting an alleged conservative blogger. I was suspected of crossing a border to illegally access government-provided services. Everybody knows Jurassic Park – the 1993 science fiction adventure film in which a team of genetic scientists create a wildlife park of cloned dinosaurs. 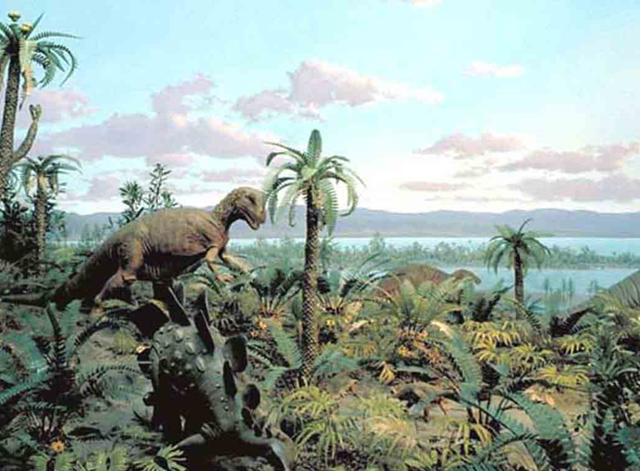 When the security systems go haywire, the dinosaurs go uncontrollably wild. Jonathan Turley is a left-leaning law prof at George Washington University …. a frequent legal analyst on CNN … not to be mistaken as a Tea Party kinda guy. He had a weekend op-ed in the Washington Post that’s a must read. It is not just bigger, it is dangerously off kilter. That is, the government agencies have gotten so big and sprawling that they have substantially more power over our lives than the 3 Constitutional branches of government … and they are, for all practical purposes, unmanageable and largely out-of-control. Nums: Scandals important, but O’s rating is up … say, what? The term “Teflon president” is being re-calibrated. Despite the Benghazi, IRS and AP scandals, CNN reports that Obama’s job approval ratings have bumped up. That’s despite the parallel findings that respondents think the 3 scandals are important, that they are indeed scandals, and that they think that the GOP-led Congress is handling the matter correctly. Nums: Will the scandal hurt the IRS’s image? According to A Pew survey, the Internal Revenue Service, now under intense scrutiny for singling out conservative groups, is one of the least-popular federal agencies. Specifically. the IRS ranks 11th out of 14 agencies (the 13 listed below plus the Homeland Security Department) in terms of public perception of their performance. Only 47% of people surveyed said they had a “very” or “mostly” favorable opinion of the IRS. I guess that folks who don’t pay income taxes think that the IRS lightening everybody else’s wallets is way cool. The IRS is the second-lowest among the 13 agencies people were asked about. The only agencies ranking lower were Eric Holder’s Justice Department (38% excellent or good), the Social Security Administration (36%) and Arne Duncan’s Education Department (33%). Gotcha: IRS admits to targeting “Patriots” … turns attention to ObamaCare enforcement. Just in case you missed the news last Friday, the IRS publicly admitted that it targeted conservative groups during the 2012 election … and then shielded itself behind a George Castanza defense. Yesterday,an Internal Revenue Service official disclosed for the first time, and by way of apologizing, that the agency that wields the taxing power of the federal government had targeted conservative groups for special scrutiny during the 2012 election season. A spokeswoman acknowledged that the agency had flagged groups with the words “tea party” or “patriot” to have their tax returns inspected. She added the tax inspections were carried out entirely by low-level workers in Cincinnati without any direction from Washington. First, a couple of weeks ago Obama bristled at the thought that some (many ?) folks don’t trust the government. What does the jabrone expect if his administration turns its bulldogs on its political opponents? Can you imagine the outcry if George Bush had told the IRS to key word search “Muslim”, “Islamic”,”Progressive” or “choice” and then said to go get ‘em. All hell would have broken loose. Americans who seek to earn a living and save for the future are confused and discouraged. Concerns of investors are asking: How does this affect my retirement fund? What about my college savings account? How does this affect my taxes? Would I be better off putting my savings under the mattress? Firms can’t see a clear road to economic recovery ahead, so they’re not going to hire and they’re not going to spend. It’s what economists call a “deadweight loss“. 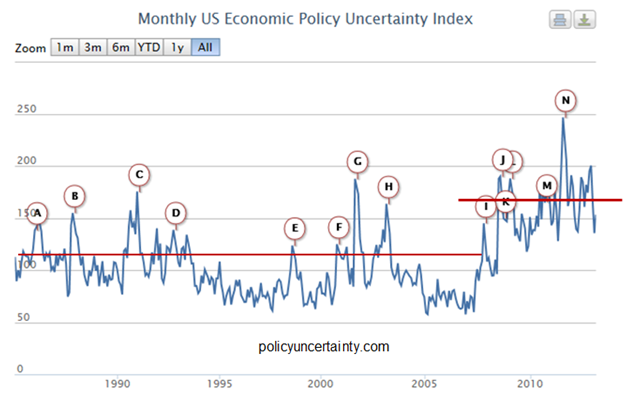 He points to economic research that indicates U.S. economic policy uncertainty has been 50% higher in the past two years than it has been since 1985. The uncertainty revolves around regulatory policy, monetary policy, foreign policy and, most significantly, uncertainty about U.S. fiscal policy and the national debt. Vanguard estimates that the rise in policy uncertainty has created a $261 billion cumulative drag on the economy … which adds up to more than one million jobs that we could have had by now, but don’t. Mr. McNabb makes a strong argument. Cajones: Congress considers an exemption to ObamaCare … to themselves! During the 2009-10 battle over what’s now dubbed Obamacare, Republicans insisted that Capitol Hill hands must have the same health care as the rest of the American people. Good for us, bad for them. Uh-oh: Where did the bombers get the money? I’d been wondering – since there has been no mention of jobs – how the bomber brothers got the dough to (a) live (b) travel to Russia for 6 months and (c) construct weapons of mass destruction. The older brother didn’t have a job and the younger one was a pot-smoking college student. The Boston Herald has just surfaced one avenue: that they (and their parents) were on the government welfare dole … so, in effect, taxpayers were paying their way. That’s bad, but is welfare enough to fund a terror plot complete with trips to Russia? So where did the rest of the money come from. DHS Chief Napolitano says there’s no way they got it from terrorist groups. 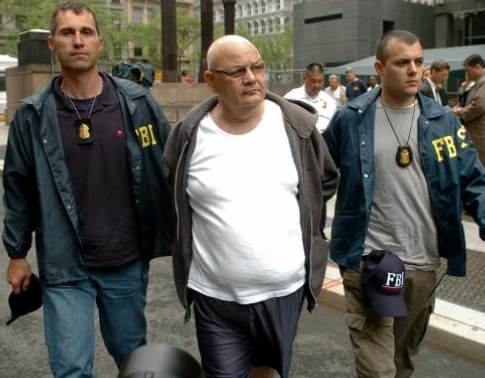 An IRS agent, an FBI agent and a gardener …. No, this isn’t the lead line of a bad joke. 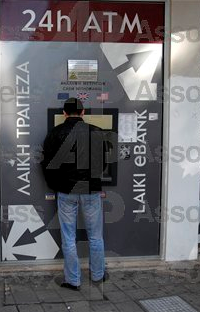 What’s so shocking about Cyprus’ tax on bank accounts? OK, Cyprus is going to slap a tax on bank accounts over $100,000. The world is aghast. The end of financial systems as we know them is in the balance. Hey Arne: Which Federal government agency is rated lowest? Last week, Secretary of Education Arne Duncan was racking up Pinocchios, trying to whip up some Sequester hysteria. He said that the world will end if the Fed’s Ed budget is cut by 2% … 40,000 will lose their jobs. His analysis was quickly debunked but, for me, it prompted a fundamental question: how is the Dept. of Education doing? Today, let’s look at perceptions. Bottom line: folks – you know, taxpayers – the Ed Dept’s “customers” — rate the Dept. 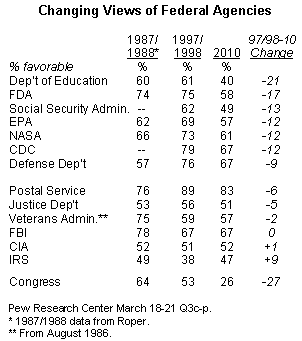 of Education the lowest among Federal Agencies … and the agency with the sharpest decline. 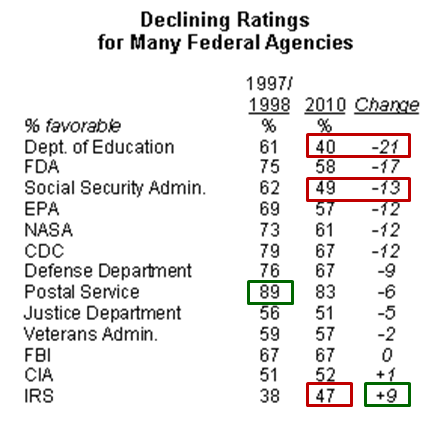 Despite spending hundreds of billions of dollars over the past couple of decades, the Department of Education gets the fewest favorability nods for Americans … only 40% give it a favorable rating … and its favorability rating is falling faster than any other agency. The Education Dept’s low ratings aren’t that surprising since the U.S. is constantly reported to be trailing other developed nations in math, science and other basic skills … and since every politician lasers in on our need to fix public education (while protecting the sanctity of the teachers’ unions). Answer to Sequestration: pray for snow ! 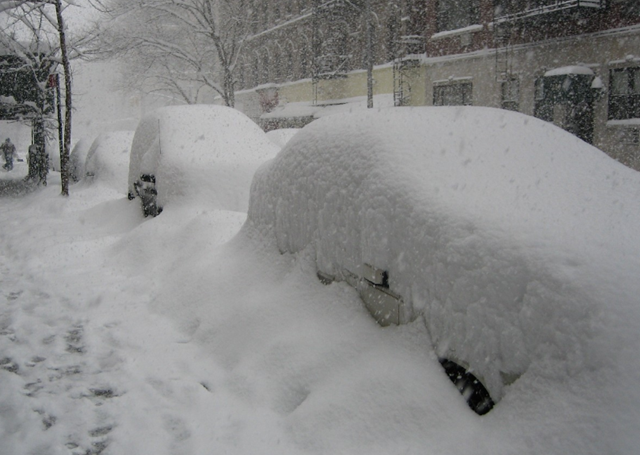 The news broadcasts today are talking a lot about Sequestration and Snowstorm Q. Do Americans think that they can trust government? Yes for state and local governments … the Federal government: not so much. 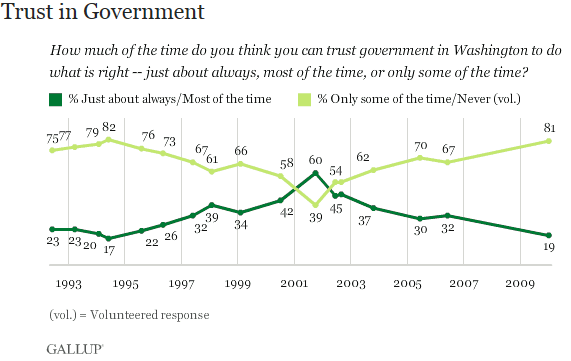 … over 80% only trust the Federal government some of the time or never. …. about 2 in 3 think they can trust their local governments. The lesson to politicos: keep it local … decentralized … closer (and more responsive) to the people. Does the Federal gov’t have a positive or negative impact on your life? According Pew Research, an increasing plurality (43%) of people think the Federal government negatively impacts their lives. 15 years ago, 50% thought he impact was positive … now, only 38% think so …..
Is the Federal government a good value? Thinking about all that the Federal government does for you, do you think that you get more or less value than what you pay in taxes? Less than 10% said that they got more value than what they paid in taxes. More than half of the respondents said that they got less value than what they paid in taxes. Of course, the last finding is most interesting since it’s a majority … and since about half of the folks don’t pay any income taxes. A Kaiser Foundation survey asked folks to grade the government on a traditional A to F grading scale. 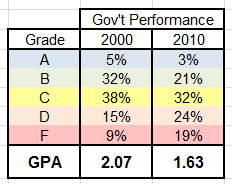 Back in 2000, the government scored a “gentleman’s C” … GPA = 2.07. 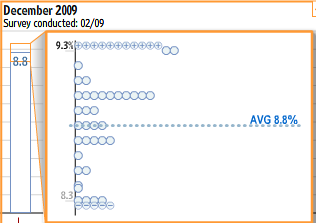 In the past decade, the GPA has dropped to 1.63 … a C-minus / D-plus. Isn’t that probationary at most b-schools? Why are (some) people opposed to big government? A colleague and I have been exchanging ideas on this topic. He’s more liberal than me (no surprise), so it’s an interesting exercise. We’re starting to find some common ground and develop testable hypotheses. Here’s one of our initial observations. Chime in, please … would love your input on this and subsequent reveals. Long ago, say 40 or 50 years, the central government mission was to provide essential common services … such as military defense and national infrastructure (aka. “Transportation”). That mission has become more “mixed” over time (see chart below). Spending on the original essential common services – while still substantial — are proportionately decreased. For example, military defense was almost 30% of Federal spending in 1970 … it’s less than 15% in 2012. Some additional layers of spending – consistent with the original mission of essential common services – have been added. For example, Homeland Security (aka. “Protection”) has been substantially ramped up. But, the bulk of additional spending over time is attributable to health & welfare entitlements, public employee pensions, education (mostly new Federal programs and administration). Time bomb warning: Note that “Interest” on the public debt has remained proportionately constant over the 40 year period. But, of course, the components are very different. In 1970, there was relatively low debt but high interest rates. In 2012, we have very high debt with historically low interest rates. The obvious uh-oh: what happens when interest rates jump up to more “normal” levels? In other words, spending trends seem to validate the observation that the implicit “government” mission has expanded from a relatively sharp focus on providing essential common services by (1) expanding the scope of declared “essential common services (think DOE and Dept. of Education) and (2) re-missioning to become increasingly a transfer payment hub for “safety net” entitlements. Apparently, the ObamaCare tax surcharge wasn’t enough to kill the tanning business. Now, California is banning use of tanning salons by minors. Governor Jerry Brown signed a bill on Sunday prohibiting anyone under the age of 18 from using ultraviolet tanning devices. Ken’s Take Carter tanked it, Reagan brought it back, Clinton held it, Bush re-tanked it, Obama sqandered hope & change to all-time lows. Majorities of Democrats (65%) and Republicans (92%) are dissatisfied with the nation’s governance. 43% have little or no confidence in the government to solve international problems. 49% of Americans believe the federal government has become so large and powerful that it poses an immediate threat to the rights and freedoms of ordinary citizens. Steve Jobs both created the PC revolution and was created by it. The PC era can be seen as the extension of the superhuman will of this one brilliant, mercurial and far-seeing figure. Every generation produces a few individuals whose will to restructure the world in their own image is so powerful that they seem to distort reality itself. That in the U.S., they often choose to pursue entrepreneurship and industry rather than politics is one of the uncelebrated blessings of American capitalism. Dems establish some bad precedents … that’ll come back to haunt them. Gotta give the Dems a hat-tip for pushing to the limits of the rules to cram their agenda in. First, it was using the budget reconciliation process to pass ObamaCare. Then, came the lamest of lame duck Congresses pushing through some debatable (but not debated or amended) legislative initiatives. Note: I don’t have a clue whether the START Treaty is a good idea or a bad idea … but for the first time in U.S. history, a treaty is being ratified by lame duckers. That sure sounds fishy, doesn’t it? Now, the FCC – working though “executive authority” – implements rules to regulate the internet. Rules that courts and legislatures have deemed inappropriate use of FCC powers. Dems are feeling pretty proud about the way they’re using the system to their advantage. But, as Grandma Homa used to say “what goes around comes around”. Just wait until the GOP uses the same tactics. The squealing will be intense. The was (and is) broadscale opposition to the Patriot Act provisions that let Feds listen in to phone chats. But, not much whining about the Feds getting their hands on all of our health and financial records. 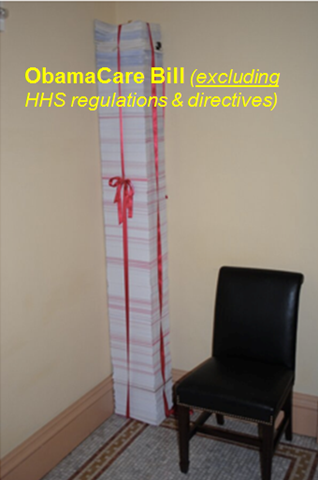 ObamaCare gives the Feds access to individual health records (though they promise they won’t do anything ontoward with them) ,,, and the new Financial Reform ductates more detailed accounting of financial transactions. The 1099 is a catch-all series of IRS documents used to report non-wage income from a variety of sources like contract work, dividends, earned interest and pension distributions. There’s massive expansion of requirements for businesses to file 1099 tax forms that was hidden in the 2,409-page health reform bill, but it’s just one piece of a years-long legislative stealth campaign to create ways for the federal government to track down unreported income and close the so-called “tax gap”. The federal government loses an estimated $300 billion each year from the “tax gap” between what individuals and businesses owe and what they actually pay. A new 1099-K aims to shine a light on a currently hard-to-track payment stream: credit cards. Starting in 2011, financial firms that process credit or debit card payments will be required to send their clients, and the IRS, an annual form documenting the year’s transactions. It applies to all payment processors, including Paypal, Amazon.com, and others that service very small businesses. The 1099 changes attached to the health care reform bill massively expand the requirements for filing the “1099-Misc” form, which companies use for recording payments to freelance workers and other individual service providers. Until now, payments to corporations have been exempt from 1099 rules, as have payments for the purchase of goods. Starting in 2012, all business payments or purchases that exceed $600 in a calendar year will need to be accompanied by a 1099 filing. Sen. Kerry calls for pirate hearings … and I think it's a great idea! (1) Now, some people make think hearings on piracy are a waste of valuable Senate time. I disagree. It might distract them from the current spending spree. (3) Question: Who will testify at the hearings? Do you think they’ll be able to get real pirates to come and answer Kerry’s inane questions? (4) Idea: Get Barry Bonds (former Pittsburgh Pirate) to come and testify. Kills two birds with one stone: steroids and piracy. Thanks to SMH for the heads-up on this one. Want more from the Homa Files? Ken’s Take: Sameulson is a left-leaning economist, which should give him some broad credibility. I think his analysis is right on target. Below are highlights. Full article is well worth reading. Judged by his own standards, President Obama’s $787 billion economic stimulus program is deeply disappointing. Given his dire warnings (about the economy), you’d expect the stimulus package to focus almost exclusively on reviving the economy. It doesn’t, and for that Obama bears much of the blame. His politics compromised the program’s economics. Look at the numbers. The Congressional Budget Office estimates that about $200 billion will be spent in 2011 or later — after it would do the most good. For starters, there’s $8 billion for high-speed rail … the design and construction will occupy many years. It’s not a quick stimulus. Then there’s $20.8 billion for improved health information technology — more electronic records and the like. Probably most people regard this as desirable, but here, too, changes occur slowly. The CBO expects only 3% of the money ($595 million) to be spent in fiscal 2009 and 2010. The peak year of projected spending is 2014 at $14.2 billion. Consider the retrofitting of federal buildings to make them more energy-efficient. Obama says “We’re creating jobs immediately.” Yes — but not many. The stimulus package includes $5.5 billion for overhauling federal buildings. The CBO estimates that only 23% of that would be spent in 2009 and 2010. Worse, the economic impact of the stimulus is already smaller than advertised. The package includes a “patch” for the alternative minimum tax. This protects many middle-class Americans against higher taxes and, on paper, adds $85 billion of “stimulus” in 2009 and 2010. One problem: “It’s not stimulus … Congress was going to do it anyway. They do it every year.” Strip out the AMT patch, and the stimulus drops to about $700 billion, with almost 30% spent after 2010. The stimulus package offers only modest relief to states. Using funds from the stimulus, states might offset 40% of their looming deficits,. The effect on localities would probably be less. The stimulus provides most funds to states through specific programs. There’s $90 billion more for Medicaid, $12 billion for special education, $2.8 billion for various policing programs. There’s a big downside: “Temporary” spending hikes for specific programs … will be harder to undo, worsening the long-term budget outlook. The major outcome: more power centralized in Washington. No one knows the economic effects of all this; estimates vary. But Obama’s political strategy stunts the impact from what it might have been. By using the stimulus for unrelated policy goals, spending will be delayed and diluted. Politics cannot be removed from the political process. But here, partisan politics ran roughshod over pragmatic economic policy. Even the token concessions (including the AMT provision) to some Republicans weakened the package. Obama is gambling that his flawed stimulus will seem to work well enough that he’ll receive credit for restarting the economy — and not be blamed for engineering a colossal waste. Since Team Obama has started the chatter that “saving or creating jobs” will be measured against an 11% unemployment rate, I checked to see what economists were saying right before the stimulus was passed. Consensus was 8.8% — to me that’s the bar to apply to Obama’s program. Let’s see what happens. Congress and The Big Three: Marriage on the Rocks? It is the end of an era — one in which automakers ruled Congress, easily deflected pressure to build fuel-efficient cars and packed their trademark shows with super-size SUVs perched on fake mountaintops. There has been a gradual erosion of the auto industry’s clout in Washington and in state legislatures. President Obama’s move last week to support strict California vehicle emission standards was another blow to the industry, already reeling from financial pressures and dismal sales. For decades, Congressional advocates protected the industry from demands for more fuel-efficient vehicles, while sophisticated and expensive lobbying and legal strategies — some taxpayer-funded — also helped the carmakers fight off challenges. But that kind of rock-solid support in Congress has worn away, as many members say they have been repeatedly misled by the companies’ promises of reform and complaints that new initiatives would spell financial ruin. In Washington, the auto industry spent $65 million last year to lobby Congress, ranking 16th among all industries, according to the Center for Responsive Politics. Its efforts largely focused on developing a national fuel economy and emissions standard weaker than the one proposed by California. Industry leaders continue to argue that Congress is trying to force them to build cars Americans don’t want, at least as long as gas prices remain low. Regardless, some trade groups acknowledge that the landscape has changed, and they are promising to work more cooperatively. Great analysis by the Washington Post. Good numbers and clever charting. Too big to extract, so here’s the link. Worth browsing. These Jeffersonian quotes have been making the email rounds. Even if TJ didn’t really say this stuff, it’s worth reading. Too bad TJ wasn’t here for the stimulus debate. Oops, I forgot. There wasn’t time for one. The Wall Street Journal has summarized what’s in the stimulus bill. Even their summary is too long to post, so here’s the link. Obama says the trillion dollar pork-laden, faux stimulative program will “save or create up to 4 million jobs”. Last week, I pointed out that “up to” provides mucho definitional cover by itself, but that the serious wiggle room comes from “jobs saved” — a comparison against some fabricated “what if” number. I can’t find any non-Obama paid economist saying 11%. Most economists are saying that the unemployment rate will peak in the range of 8 to 8.5% if we do nothing. Apparently, Team Obama is prepared to declare success (i.e. 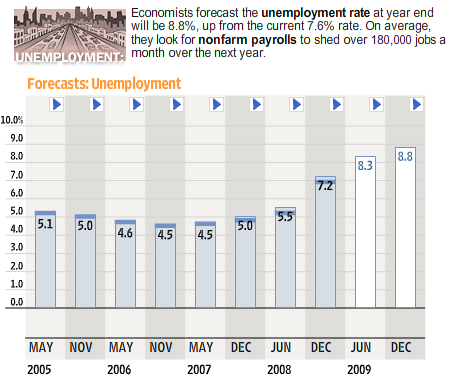 claim millions of jobs saved) is the stimulus plan does about as well as doing nothing. The jobs saved will be calculated against a disaster scenario that they’ll specify, thank you. For decades, government has intervened in the mortgage market, in the name of the “public interest.” There was the creation of Fannie Mae and Freddie Mac, the Home Mortgage Disclosure Act of 1975 and the Community Reinvestment Act of 1977, the Financial Institutions Reform Recovery and Enforcement Act of 1989 and the Federal Housing Enterprises Financial Safety and Soundness Act of 1992. There was the demand in 2000 by HUD that Fannie Mae dedicate 50% of its business to low- and moderate-income families. And there was President Bush pushing homeownership for all as the way to prosperity. In 2000, for example, the Fannie Mae Foundation identified the “Outstanding Accomplishment” of Countrywide Financial Corp. as making almost one-sixth of its mortgages to blacks, Hispanics and Native Americans. Certainly, the people formerly employed by Bears Stearns now have a clearer perspective on the value of those mortgages. Government regulation and political correctness are at the root of recent organizational failures that, in turn, have resulted in massive taxpayer-financed bailouts. New government intervention is trying to address the problems created by prior intervention — and futilely, it appears. Now that the Feds have bailed out the states, will the governors have to be like the bank CEOs and give up their state owned airplanes & helicopters? I know they have them … rode on a couple of them a few years ago. Let’s have Barney Frank make the governors come in and raise their hands if they have one. Understandably, many voters were frustrated by President Bush’s well-recognized performance and personality shortfalls, unswayed by John McCain’s erratic campaigning and unnerved with his controversial “long balls” (think Palin and “suspending the campaign”), and vulnerable to Obama’s messianic symbolism, historical breakthrough, and his “cooler than cool” promise of hope and change. Swing voter’s bought in. Even though hard evidence was sorely lacking, they concluded that maybe, just maybe, Obama was the real deal and that he would usher in a new era of cooperation, high sprits, and progress. The first 20 days of the Obama administration — arguably 20 “dog days” given the economic challenges and the fast-paced, high-pressure legislative turmoil — have provided the answers to questions regarding Obama’s character, positions and executive style. The real Barack Obama has revealed himself — for better and for worse. First, President Obama has stayed true to his stated support for abortion rights, terrorist rights, unions, and community organizations. And, he has been consistent in his suspicion and disdain for businesses and the people who run them. Nobody should be surprised by any executive orders and bully pulpit proclamations on those topics. On those counts, the voting majority got what they should have expected, and apparently, what they wanted. But, there have been serious — and much forewarned — contradictions revealed, too. The promise of “line by line scrubbing of waste in the budget” was immediately discarded for “about the right size and scope” and “no time to wait for perfection”. The “no special interests” promise was modified to allow unions and machine politicos to get seats at the table. The “new faces, well-vetted outsiders” became a parade of recycled Clintonites, and tax-dodgers. Obama’s discipline, “Mr. Cool” demeanor, and rhetorical splendor quickly denigrated to an amateurish lack of legislative control, and un-presidential sarcasm and attack-dogging. The politics of “hope and change” were shelved in favor of the politics of catastrophe-mongering and political monkey business as usual. President Obama has dutifully heeded Rahm Emmanuel’s advice to “never let a good crisis go to waste. While the legislative process has been sloppy, the President ended up getting what he wanted in his stimulus package. Unfortunately, the expensive grab bag of pork and paybacks is unlikely to have any perceptible stimulative effect on the economy. For the next year or two, we’ll be hearing that Bush’s failed policies left the economy in even worse shape than anyone imagined and we’ll get bombarded with TARP-like claims that things would have been even worse without the added spending. Jobs will continue to evaporate, but at a slower rate than some made up “what if” number. The President has deftly managed to move his social agenda forward at warp speed. His refundable tax credits are now in place, and a voting majority of Americans will pay no income taxes. Healthcare is officially on the track to nationalization, Alternative energy gets a boost with government rules and spending. In November, the majority of Americans were willing to bet on the come for hope and change. Now, President Obama keeps reminding us that he won, so he — along with Pelosi and Reid — set the rules. The rules are becoming clearer by the day. Reid & Pelosi slashed Pres Obama’s pride and joy, the $500 refundable tax credit down to $400 per worker. My hunch: odds are even lower at $1 per day … or, to be peresise, a buck and a dime per day. Pelosi and Reid also scratched the GOP’s idea of a $15,000 tax credit on the purchase of a new home. While I think it would have had a minimal impact, it was at least pay-as-you-go. Credits could only be claimed when houses were purchased, and there was a cap on the amount. Would have at least made Congress look like it was trying to address the housing problem. The tax cuts included in the current version of the stimulus bill deserve the resounding “thud” that they’ve been getting. Setting ideology aside and just resorting to basic arithmetic reveals the plan’s glowing deficiency: it is so “in the box” and marginal that it is unlikely to have any measurable effect on the economy. Rather than slashing at the economy’s jugular, the tax cuts barely scratch the capillaries. For example, take President Obama’s pride and joy, the $500 refundable tax credit. Does anybody really believe that $1.37 per taxpayer per day is going to jump start the economy? Or, will an extra $40 per month save many struggling mortgage holders from foreclosure? Similarly, take the GOP’s idea of a $15,000 tax credit on the purchase of a new home. Somebody buying a $150,000 home with a 5%, 30 year mortgage would save about $80 on their monthly mortgage payment (getting it down to about $750) and provide a $15,000 equity cushion, just in case home values fall further. Is that really enough incentive to pull job-threatened folks off the sidelines? The annual AMT adjustment would have happened later in the year anyway, especially since its greatest impact is in Democratic strongholds with high state income taxes (think NY, CA. NJ, and CT). That said, its average impact is about $2,400 for affected taxpayers. These folks earn enough to have an AMT problem, so an extra $200 per month isn’t likely to change their shopping behavior, let alone their life style. The biggest business tax break is the tax loss carry backward which allows retroactive tax credits (refundable I assume) for companies that made money during the boom but are tanking during the bust. Again, the extra money may keep some marginal companies on life support for awhile, but isn’t likely to turn a struggling company into a jobs creator. Congressional thinking has been trapped in partisan boxes. Many ideas have been death-branded as either old and tired, or as favoring the rich. No big ideas have been proposed that could realistically get the economy moving again. There are big ideas for the politicos to consider if they are really serious about moving the economy forward. First, there is the tried and true investment tax credit. Give companies a 15% ITC for investment spending in 2009, and a 10% ITC for investment spending in 2010. If necessary, sweeten the pot by allowing 2009-2010 investments to be written off on a very accelerated basis (say, over 3 or 5 years). Second, give multi-nationals a tax holiday on repatriated earnings. Cut the 2009 rate from 35% to 5% or 10%. Such a move could bring over $500 billion back into the U.S. from foreign stashes, and generate $25 to $50 billion incremental tax revenue. Otherwise, companies will use the money in their foreign operations and the U.S. tax take will be zero. Third, give companies that maintain or grow their workforce a payroll tax rebate. For example, a company that contributes the same amount of payroll taxes in 2009 as it did in 2008 might get 25% of its aggregate contributions rebated; a company that pays in10% more payroll taxes year-to-year might get a 50% rebate. A company that shrinks its workforce gets no rebate. Fourth, since a depressed housing market is the root cause of the economic turmoil, adjust the standard income tax deduction a bit and allow the two-thirds of all taxpayers who use it to deduct their home mortgage interest payments. This move alone would put money into more than 35 million pockets, might save a few people from foreclosure, and could coax some new buyers into the market. Fifth, eliminate capital gains taxes on all residential real estate purchased in 2009 that is held at least 18 months. This initiative would certainly get investor-landlords back into the market. They could buy some of the existing excess homes’ inventory, and deploy it as affordable rental housing. Sixth, eliminate capital gains on all stocks bought in 2009 and held for at least 18 months. Doing so would jolt the stock market upwards. Would it favor the rich? Sure. But it would also help restore the value of soon-to-retire baby boomer’s IRAs. These ideas are representative of the pool of big ideas that have been overlooked in the stimulus package. It is time for Congress and the President stop playing small ball and go for the fences. Give us something that we can believe will work. Trust me, this is worth watching. Call me cynical, but Pres Obama’s promise of “up to 4 million jobs created or saved” sounds like a pretty soft metric to me. First, there’s the “up to” part. So, if the final answer is, say 2 million, the metric is made. But, the real weasle room is in the “created or saved”. What exactly is a saved job? How do you know one when you see it? My bet: For the next year or two, we’ll be hearing that Bush’s failed policies left the economy in even worse shape than anyone imagined and we’ll get bombarded with TARP-like claims that things would have been even worse without the added spending. Jobs will continue to evaporate, but at a slower rate than some made up “what if” number. For sure, we’ll have saved up to 4 million jobs. According to Obama’s economic adviser Lawrence Summers, Barack-O decided to delay unveiling the administration’s new bank bailout plan until Tuesday, in an effort to keep Washington’s focus on the stimulus package now before Congress. In other words: to keep the spotlight on the President’s prime time press conference tonight. My prediction: the market will tank today because of the bank plan delay — the delay prolongs uncertainty and creates doubt that the administration — with an avowed policy of “big & fast” over “deliberate & right” — has figured out what to do. All the chatter today will be about the market slide and bank plan. Maybe that’s the strategy — take people’s eyes off the (un)stimulus package. Ken’s Take: Under Bush, terrorist renditioning was dirtier than dirt. A clear violation of terrorists rights. Now, it’s ok. Hmmmm. The CIA’s secret prisons are being shuttered. Harsh interrogation techniques are off-limits. And Guantanamo Bay will eventually go back to being a wind-swept naval base on the southeastern corner of Cuba. Current and former U.S. intelligence officials said that the rendition program might be poised to play an expanded role going forward because it was the main remaining mechanism — aside from Predator missile strikes — for taking suspected terrorists off the street. The Obama administration appears to have determined that the rendition program was one component of the Bush administration’s war on terrorism that it could not afford to discard. “In some ways, [rendition] is the worst option,” the former official said. “If they are in U.S. hands, you have a lot of checks and balances, medics and lawyers. Once you turn them over to another service, you lose control.” the prisons, it is not done taking prisoners. Pres Obama and his surrogates have taken to repeating a mantra: the stimulus bill must be big and must be enacted quickly or else we’ll face an economic catastrophe. The logic: we’re already taking a shelling and economists say $1 trillion is about the right number. I’m struck that the emphasis is on big and quick … not right and effective. There are parts of the proposed bill that make sense and seem to have consensus — e.g. extending unemployment benefits. Others are debatable philosophically but can probably pass the “does it stimulate” criteria — e.g. Barack O’s $500 refundable tax credits. Many (most ?) are outright pork and pay-offs. Why not break the bill into parts? Pass the stuff that’s on target and relatively non-contentious now … then debate the marginal and flakey stuff in due course. Since most of that stuff won’t make a bit of difference to the economy, delaying won’t matter. Even if $1 trillion is the right number, we can roll up to it … it’s not necessary to swallow it in one huge gulp. Back in December, the Detroit Three argued for a bailout because American consumers won’t buy General Motors and Chrysler cars if they are forced into bankruptcy. They would be tainted by a stigma and by worries that warranties and parts wouldn’t be available years down the road if the firms ran the risk of liquidation. They cited consumer surveys that support the view. One survey of 6000 consumers by CNW Research this summer found that 80% said they would abandon an auto maker if it were to file for bankruptcy. At the time, I called out the automaker’s bankruptcy argument as completely specious. Well, January sales results for the automakers are in. According to the Wall Street Journal: “Sales by the Big Three U.S. auto makers plunged in January to the lowest levels in decades, raising fresh questions about the future of the companies and the viability of the government’s bailout program. Is there anyone who doesn’t recognize that the Detroit automakers are hanging by financial threads? The companies are bankrupt, they’re just not in legal bankruptcy proceedings. If they were, they’d at least stand some chance of restructuring themselves into healthy positions. The current government thinking stands no chance of doing that. So why not simply have them file for bankruptcy proceedings? Simple, bankruptcy proceedings would dismantle the high cost, work rules heavy UAW contract. Politics trumps market forces and economic sense. Did the Social Security crisis just go away ? A couple of years ago, the hot socio-economic topic was the projected insolvency of Social Security. Remember how Al Gore wanted a “lock box” to insulate FICA contributions from Congressional money grabbers? Or, how Bush wanted to privatize Social Security so folks could earn higher returns? Now, pundits (e.g. Robert Reich, Larry Lindsay) are calling for payroll tax holidays. President Obama is bound and determined to give payroll tax rebates to low income folks who don’t pay income taxes. That is, to reduce their Social Security contributions … by about $135 billion annually. Does that mean that Social Security has miraculously found strong financial footing? Currently, about $785 billion in Social Security taxes are collected annually from about 163 million workers and $585 billion in benefit checks are sent out to 50 million Social Security recipients. Well, according to the Social Security trustees, because of demographic shifts (i.e. more retirees, fewer workers), outflows will exceed inflows somewhere around 2020 — a little earlier if interest on the trust isn’t counted, a little later if it is. And, they project that the trust fund will be completely exhausted by around 2040. With t-bill rates now hovering slightly over zero, earnings on the Social Security trust must be minimal (and less than considered in the projections). So, if the Feds cut contribution inflows to the trust by over $100 billion annually, won’t Social Security be in a world of hurt — sooner rather than later? I haven’t heard any of Obama’s smart guys in the room talking about this part of the problem … and it’s a big part ! Congress collects about $785 billion in Social Security taxes from about 163 million workers to send out $585 billion to 50 million Social Security recipients. Social Security’s trustees tell us that the surplus goes into a $2.2 trillion trust fund to meet future obligations. The problem is that whatever the difference between Social Security taxes taken in and benefits paid out, Congress spends it. What the Treasury Department does is give the Social Security Trust Fund non-marketable “special issue government securities” that are simply bookkeeping entries that are IOUs. According to Social Security trustee estimates, around 2016 the amount of Social Security benefits paid will exceed taxes collected. That means one of two things, or both, must happen: Congress will raise taxes and/or slash promised Social Security benefits. Each year the situation will get worse since the number of retirees is predicted to increase relative to the number in the work force paying taxes. In 1940, there were 42 workers per retiree, in 1950 there were 16, today there are three and in 20 or 30 years there will be two or fewer workers per retiree. According to the Rasmussen Reports, President Obama’s approval index (the % of people strongly approving of the job he’s doing less the % of people strongly disapproving of the job he’s doing) is down by half since inauguration day — from 30% to 15%. Hmmmmm. “Page by page, line by line” … oh, just kidding. Candidate Obama promised that waste and special interests would be clinically scrubbed from the entire Federal budget. So, I wonder: why didn’t his crack team scrub the pork-laden, non-stimulating $819 BILLION “stimulus” package? Said differently, why should we expect that they’ll do a better job on the full $10 trillion Federal budget ? Dire prediction: For the record, if the stimulus package is passed in its current form — or a similar pork-laden variant — the Dow will go to 5,000. President-elect Barack Obama vowed today to get rid of federal programs that no longer make sense and run others in a more frugal way to make Washington work in tough economic times. “In these challenging times, when we are facing both rising deficits and a sinking economy, budget reform is not an option. It is an imperative,” Obama said.